A spring clean is in order and the first place you should start is your wardrobe! Sure, amazing weather isn’t always guaranteed in Britain, we’re used to that, but when the sun does sneak out from behind the clouds, we’re first in the beer gardens with an ice-cream and a new pair of sunnies. That’s why there’s no better time to update your look. How do you go about looking AND feeling cool this spring/summer? Our brand new linen collection is just what you need. Linen workwear: how to stay chilled in the office! 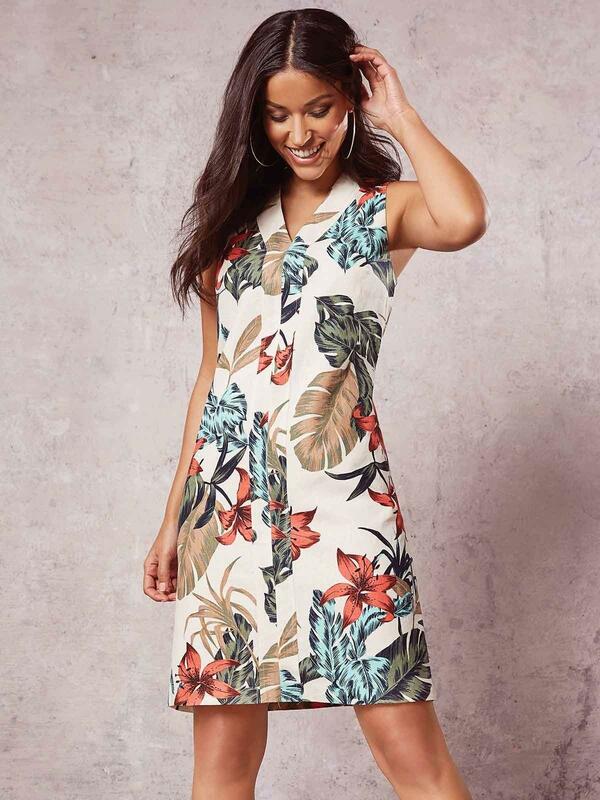 Office can be uncomfortable places when temperatures start to ramp up, so having a selection of stylish-yet-incredibly-breathable linen dresses to choose from is an absolute must. Our Cream Floral Linen Shift Dress is the perfect piece to take you from the office to post-work drinks. Sleeveless and flattering, this above-the-knee dress just sings desk-to-dress. Prefer to keep your legs covered? We’re got you, erm…covered! When you’re putting together your spring/summer wardrobe, variety is your middle name if you want to keep things fresh. If you are anything like us, there’ll be some days when you just don’t fancy showing off your legs and some lightweight linen pants are a must. Choose an on-trend, wide-leg cut in our elastic Black Linen Trousers and team them with a beautiful bardot to nail the floaty yet tailored look. This Pink Cold Shoulder Top was made for your new pants, with a pretty floral print and ruffle detailing. You’ll be able to show off the amazing tan you’ve got too (fingers crossed!). You’ll look and feel great when you head out for bottomless brunch with the girls sporting our Navy Tropical Linen Skirt. 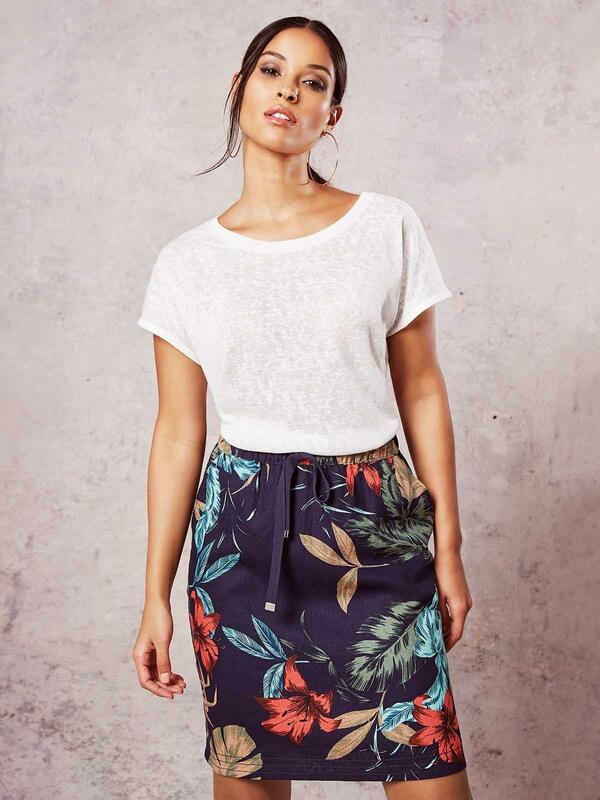 Team with our White Knot-Front Tee for a casual yet stylish look- this pairing is as well suited to your local brunch spot as it is to a sun-kissed beach along the Mediterranean. Either way, you’d better make sure you’ve got a glass of prosecco in your hand! Dressing for BBQs in the sun! As soon as we feel warm outside without a coat on, you’d better believe that the barbecue is coming out! Whether or not you fancy the overcooked burgers that your group’s chosen chef is cooking up, you’ll want to make sure your outfit is up to scratch. Our new collection features a number of chic linen shorts, so you’ll be spoilt for choice when it comes to baring your pins. The Stone Stripe Linen Shorts are up these as our favourites, mainly because they go with pretty much anything that you can tuck in. For the first outdoor get together of the season, match your shorts with our Navy Sleeveless Shirt and, just to be on the safe side, bring along a low key Indigo Denim Jacket for when the sun goes down, too. Let’s not push our luck when it comes to staying warm! Date nights can be exciting and scary in equal measures- especially if it’s a first date. That’s why it’s oh so much more important that you feel comfortable (and look incredible at the same time!). Don’t stress though – we’ve got your back! Our Red Asymmetric Linen Dress exudes style and you can easily dress it up or down depending on the occasion/venue/how keen you want to look. As far as confidence-boosting summertime date night ensembles go, this is exactly what you’re looking for. Ready to update your wardrobe for Spring and Summer?You can check out our entire new linen collection right here. We love to see you getting inspired by our style tips, so please do tag us in your pics on Insta @peacocks_fashion for a chance to be featured on our page!